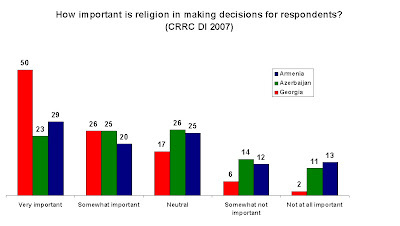 Georgia has most people saying that religion plays a very important role in making decisions. 50% say it is very important, and another 26% say it is important. So, nearly three quarters of the respondents accord religion a central role in their life. In two other countries religion plays very important and important role in making decisions for around 50% of the respondents. Georgia also has the highest number of respondents who attend religious services apart from special occasions. Thus, 6% of respondents attend religious services more than once a week and another 12% once a week. In contrast, only around 3% of the respondents in Armenia and Azerbaijan attend religious services more than once a week and another 7% and 3% once a week respectively. 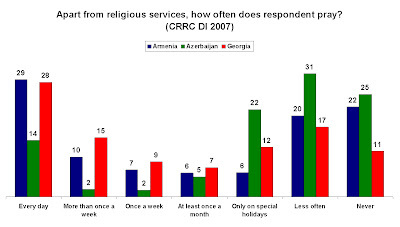 Praying apart from religious services is more popular among the respondents in Armenia and Georgia. Hence, 29% of the respondents in Armenia and 28% in Georgia say that they pray every day, in comparison to 14% of those in Azerbaijan. In addition, more respondents say that they pray less often (31%) and never (25%) in Azerbaijan. Though fasting is a part of religious traditions in all the three countries, it seems to be less practiced across the South Caucasus. Among the three countries fasting is more followed in Azerbaijan, where 14% of the respondents always fast and 9% often fast. Overall, around 50% of the respondents in Azerbaijan either fast always, often or sometimes. As a comparison, only 2% of those in Armenia and 6% in Georgia always fast. The number of those who never fast is the highest in Armenia -79%. To explore this topic more check out CRRC Data Initiative.